Sugar maple (Acer saccharum) leaves in autumn. 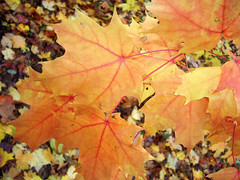 Photographer: Ery Largay, courtesy of NatureServeDo you know the sugar maple tree? (Think fall in New England, or picture the Canadian flag.) This tree is common in northern U.S. forests, and loves shaded slopes on moist soils that contain at least moderate levels of plant nutrients . Ecologists wonder whether sugar maple is native to Rock Creek Park, or was originally planted there and later naturalized . Many suspect it was planted. Why? Clue 1: Mature sugar maple is completely missing from several sizeable old forested sections of the park where conditions seem perfect for it – such as several moist, protected ravines underlain by basic igneous rock (which weathers into nutrient-rich soil ). Clue 2: Where are the oldest, most abundant sugar maple trees in the park? Right where the geology is not what you’d expect a sugar maple to prefer – mostly acidic soil (though there are a few small bodies of basic rock embedded there). Yet in a few other locations, not too far away, you find only a handful of young sugar maples. Guess what the habitat there is like? Excellent for sugar maples (north-facing moist slopes over basic rock). Doesn’t that seem backwards? Let’s try to deduce a plausible story from the clues: What if, well over a century ago, someone planted the first sugar maples near where that oldest grove is found today? When those trees matured, they would have produced seed, which would have been carried away into the forest by wind, water, squirrels, or other small animals. If conditions were good enough, some of the escaped sugar maple seeds would have germinated from time to time. Much later, as those seedlings grew up into mature trees, their seeds would escape into nearby woods, and sugar maple seedlings would show up still farther away from the original grove. According to this story, the reason you find only a few young saplings of sugar maple in the prime habitat, is that the seeds have only recently spread that far. Where the oldest sugar maples are, is probably the "epicenter" of naturalization. One more clue: where are some of the oldest, most abundant sugar maple trees in Rock Creek Park? Not too far from Klingle Mansion – the historic home of wealthy nurseryman Joshua Peirce, who raised trees for street plantings in the first half of the 1800s. So, what do you think? Native or naturalized? Solving this mystery will be challenging. DNA tests could compare the sugar maples of Rock Creek Park with the nearest known native populations to see whether they might be related. But even if they are, who’s to say whether birds, Native Americans, or the Peirce family first brought their seed to Rock Creek?